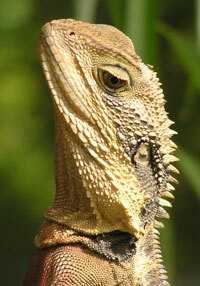 Spike is an Eastern Water Dragon, and lived in our garden in Cheltenham for several years. 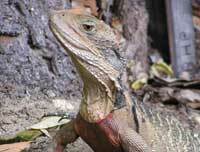 Spike's a male - as can be seen by his red chest, which will become darker as he gets older. He's around 50cm (20 inches) long - that's from the tip of his nose to the end of his tail - not that we've ever measured him - he's not that domesticated. 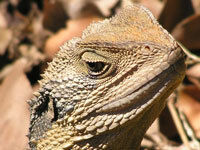 Eastern Water Dragons can grow to 90cm. 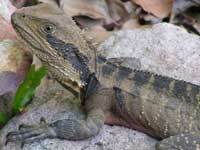 Eastern Water Dragons can be found along the east coast of Australia and adjacent hinterland - from Cape York Peninsular to Eastern Victoria. Spike spends hours being still and watching, waiting for an insect to land nearby. Then he'll jump or bound and grab it on his tongue. Spike hibernates from late Autumn, returning in late Spring. The photos were taken in Cheltenham in Sydney.